The Power Curves™ Black Stallion is our top of the range stick, in our exciting new signature range of sticks. Switch to insane mode with Black Stallion, Power Curves™ composite field hockey stick. Braided Field Hockey Sticks are specially designed with lighter weight which gives maximum strength and immense hitting impact with more power and also control torsion during hitting. In braided technology, cluster of braid fabricated with group of yarn together into a large and stronger form without edges to create tensile strength from handle to head, moreover all the fibers within a braid are continues and mechanically locked. This means that braid is more stronger and tougher as compare to matrix technology used in other brands of sticks. GFT (Grain Feel Touch ) - The stick playing hook area is treated with compound to have rough surface th get more feel for the ball while stopping, dribbling and hitting the ball. Twin Core unique chamber technology creating exceptional potential for strength, durability, and suberb hitting power. ESS (Extreme Stiff Stick) - High carbon stick with percentage of 100% carbon. The compound mixed to perfection in a mold architected for performance. Reinforced extreme stiff stick with high tensile carbon and penetrated with high performance resin content which crteates significant stiffness and sensational hitting power. LB (Low Bow) - Low bow with with max curve location at 260 mm curve location on 36.5" stick. Super drag flick potential. CCF (Carbon Cloth Fabric) - Additional carbon cloth fabric wrap on the stick to provided more grace and strength to stick. MFP (Multi Finish Paint) - Different high quality variation of paints on sticks suitable for areas to provide beautiful appearance to the stick. RBH (Reinforced Back Hand) - Specially reinforced back hand by incorporating innegra layer which preserve back hand area, increase resistance and prevent breakages. We believe that grips are as important as the stick itself, having a proper grip on your stick can do wonders to your game and helps greatly in handling, controlling, stopping and hitting the ball. GEL Incorporated Power Curves™ grips are installed on these high end sticks to ensure you get the soft feel and maximum grasp on the handle and make use of your skills to the maximum potential. Tried this stick and quite happy playing with it. you have to get little used to it as deflection is bit more while stopping the ball but once you get used to it you will love it. Stick is on a bit heavier side and I am a mid fielder, which works great for me. 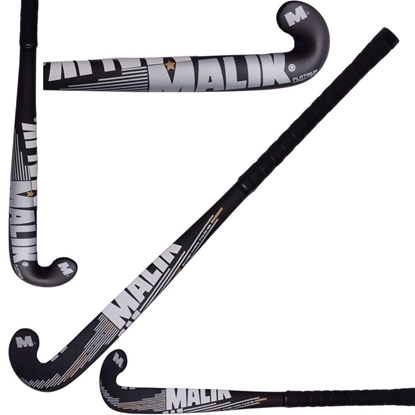 The Malik Platinum Multi Curve is the top range stick in the DC Carbon Tech Range. This is a great stick for the experienced player out there who is keen to take their game to the next level. This stick is the number 1 choice of German Internationals Moritz Polk, Jana Teschke and Cecile Pieper. Free Hockey Stick bag Included with your purchase This stick has these key features- •	90% Carbon •	24.5 Xtremme Low Bow with Multi Curve •	The position of the bow is 210mm from the sticks hook. This is a great stick for the drag-flickers and offensive forwards, and also comes with a U Hook for mastering those all-important 3D Skills. The stick has a touch compound for improved feel of the ball helping with more accurate trapping and handling. This stick is without doubt one of the top sticks for hitting and sweeping the ball. Available Sizes: 36.5" & 37.5"
The Power Curves Red Curve is elegant light weight stick made of 90% carbon with 10% fiber glass. This is a stick that will help you take your game to a higher level. Free Hockey Stick bag Included with your purchase It has a very striking look with its Red Buff Grip and jet black design with bright red sticker. Super stick with great features, magnificent feel and precise control. 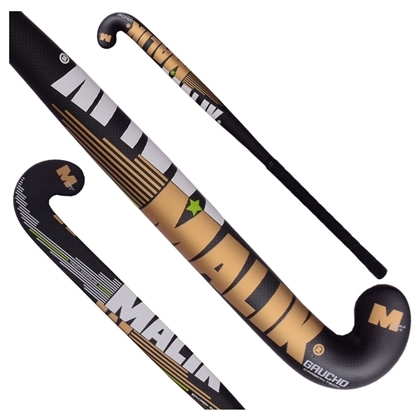 Available Sizes: 36.5" & 37.5"
Malik’s Gaucho Carbon-tech Dribble Curve stick is back for 2018 and is the top stick in the Carbon-tech dribble curve range. This is a great stick for that experienced player out there that is looking to excel at the highest level of hockey. This is currently the preferred choice at international level by Dutch player Kelly Jonker and several world class players. Free Hockey Stick bag Included with your purchase The key features are- •	90% Carbon •	Dribble Curve 24mm L-Bow •	The position of the bow is 270mm from the hook of the stick. The oval shaft of the stick gives the player a much firmer grip and the thin end of the sticks hook helps to better define a players dribbling skill. Available Sizes: 36.5" & 37.5"
Junior Field Hockey Stick available in sizes 35 & 32 inches length. Free Hockey Stick bag Included with your purchase Great sticks for young kids learning to play field hockey. The sticks come in beautiful red, blue, black & gold unisex design suitable for both boys and girls. Light weight composite stick with black Power Curves grip. 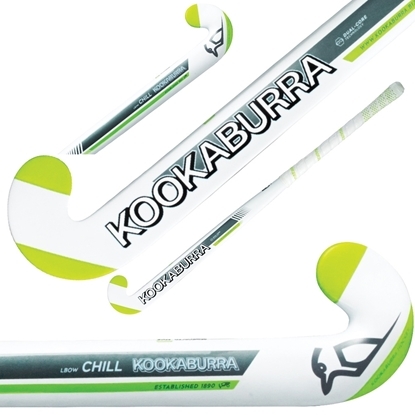 Available Sizes: 32" & 35"
The Kookaburra Chill L-Bow Obscene 2016 Model is designed for the modern hockey player. 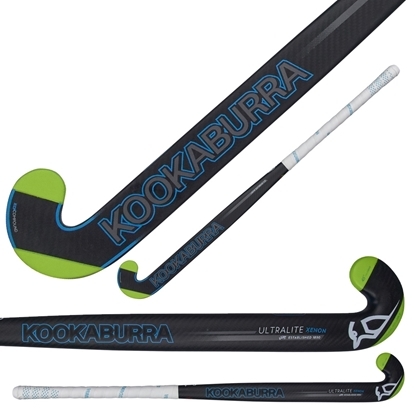 Some of its key features are- Free Hockey Stick bag Included with your purchase - Kookaburra Maxi Head - Oval Handle and Energy groove - Pro Hold Grip You will stand out from the crowd with this stick and its beautiful white design with yellow and green trim. Available Sizes: 36.5"
Shimmering Orange Coral stick light to medium weight with grain feel touch on the hook. Free Hockey Stick bag Included with your purchase Great ball control with medium bow best for mid fielders. Stick is loaded with tons of features for modern day field hockey players. High carbon 50% to 50% fiber glass ratio. Stylish high performance stick. Available Sizes: 35", 36.5" & 37.5"
Beautiful Power Curves White Snow stick is made in a low bow with groove mold. Ideal for drag flickers with optimum roll of the ball on stick. It has a very striking pure white as snow look about it. Unique stick with black Eva foam grip specially made for this kind of stick. Free Hockey Stick bag Included with your purchase Available Sizes: 36.5" &37.5"
Senior model of Wonder Stick with ,b>40% carbon and 60% fiber glass construction. Free Hockey Stick bag Included with your purchase Light weight with continuous bow from head to toe. Reinforced back hand with fibers for strength and power. Elegant looking stick comes packed with power punch while striking the ball. Our signature colorful composite stick. Available Sizes: 36.5" & 37.5"